Less than one week before Apple's third quarter fiscal results are released on July 21 at 2:00 PM Pacific, multiple research firms and analysts have released earnings previews for the three-month period ending June 30. The consensus is that Apple will report another quarterly earnings beat based on stronger than expected iPhone sales and continued year-over-year growth in China. Apple provided third quarter guidance of revenue between $46 billion and $48 billion, gross margin between 38.5% and 39.5%, operating expenses between $5.65 billion and $5.75 billion and other expenses of $350 million, while the consensus among analysts was an EPS of $1.79. 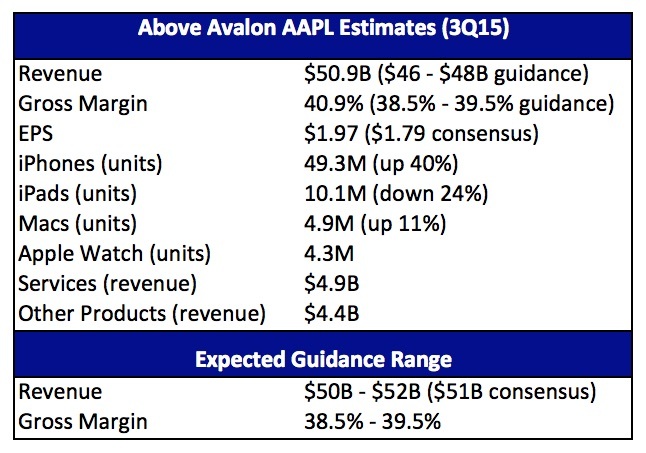 Apple is expected to beat both that guidance, which is purposefully conservative, and street expectations. Wall Street and Silicon Valley analyst Neil Cybart published his 3Q15 earnings preview on Above Avalon, predicting Apple earned $50.9 billion revenue, with a gross margin of 40.9% and $1.97 earnings per share (EPS), based on sales of 49.3 million iPhones, 10.1 million iPads, 4.9 million Macs, 4.3 million Apple Watches and $9.3 billion from other products and services. Creative Strategies principal analyst Ben Bajarin estimates that Apple Watch worldwide sales were 4.7 million during the June quarter, topping the roughly 1.1 million iPhones and 3.3 million iPads sold in their respective launch quarters. Bajarin's estimate is based on supply chain output tracked by his market research firm, and is 400,000 units higher than Above Avalon's estimate. Apple has not publicly disclosed any official Apple Watch sales figures to date, and will be grouping the wrist-worn device under its "Other Products" category in quarterly earnings reports. The combined category includes sales of iPod, Apple TV, Beats Electronics and Apple-branded and third-party accessories, which will inevitably lead to predictions about how many Apple Watches make up the total units sold. 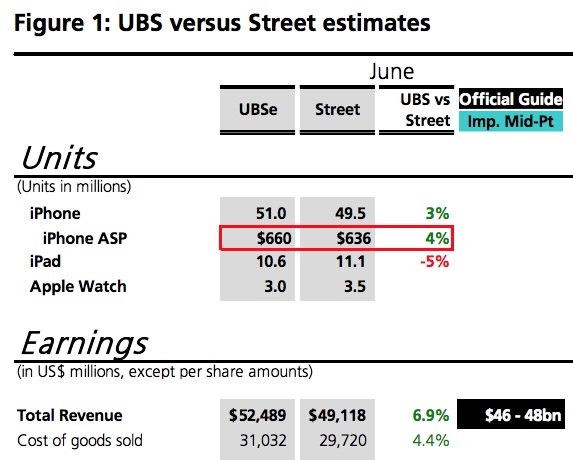 Investment banking company UBS also forecasts that Apple will have above-consensus earnings results based on a higher iPhone average selling price (ASP) estimate of $660 vs $636. The firm predicts Apple will report $52.5 billion revenue, with a gross margin of 40.9% and $2.00 EPS, based on sales of 51 million iPhones, 10.6 million iPads and 3 million Apple Watches. RBC Capital Markets is more conservative with its estimates, expecting that Apple will report $49.3 billion revenue, with a gross margin of 39.3% and $1.78 EPS, based on sales of 46.5 million iPhones, 11.3 million iPads and 4.6 million Macs. The firm did not estimate Apple Watch sales and expects scrutiny from investors in regards to Apple's iPhone unit sales globally, but particularly in China. MacRumors will provide live coverage of Apple's third quarter results on July 21. 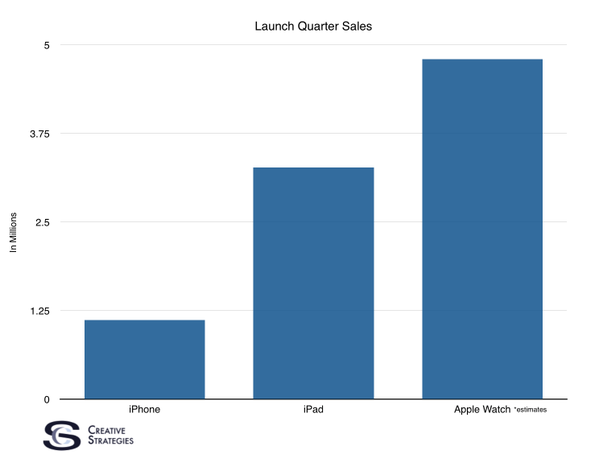 The Watch singlehandedly beat the iPhone and iPad launch quarters. What a flop! If you expect to beat expectations then you're not beating expectations, that's absurd, pure oxymoron. Well, if you count iPad sales in Q1 also beat those of the iPhone, and count how badly the iPad is faring, I'd say long-term product sales are inversely proportional to the product's initial success. So, based in this (yes, I'm an analyst) I conclude the Apple Watch will be a flop. I never know how impressive to find statistics like this given that the success of the former products lead to more initial hype around the latter. Imagine how the sales of the iPhone would've been affected if the releases were: Watch-like thing in 2007, iPad in 2010, and iPhone in 2015. Apple expected to beat expectations? That's no problem, let's just raise the expectations. maybe since 2007 millions of new customers never had Apple products before and bought iPhones and/or iPads enlarging the "core base"? do you want to compare how many cars were sold in 1920 and in 2014 and say the Ford T was a huge flop compared to any Toyota Corolla? I can't wait to see the new form factor in 7 I guess. I really hope there isn't a bezel! Me too! I want to see a small reduction in the bezels from the sides and a bigger one in the top and bottom bezels. The thing in the picture is not an iPhone ¿? Apple Watch worldwide sales were 4.7 million during the June quarter, topping the roughly 1.1 million iPhones and 3.3 million iPads sold in their respective launch quarters. I never know how impressive to find statistics like this given that the success of the latter products leads to more initial hype around the former. Imagine how the sales of the iPhone would've been affected if the releases were: Watch-like thing in 2007, iPad in 2010, and iPhone in 2015.